What intelligence / information has been released so far that support the hypothesis that the chemical attack was conducted by the Syrian government? Isn't it a very complex scenario with many rebel groups and ISIS all in a power struggle? Wouldn't there be other organisations besides Assad's regime that may benefit from a chemical strike, especially if it provokes American intervention? Survivors of the attack claim that bombs delivered the chemicals and the Pentagon released a map tracking the flight of a plane it says dropped those bombs. 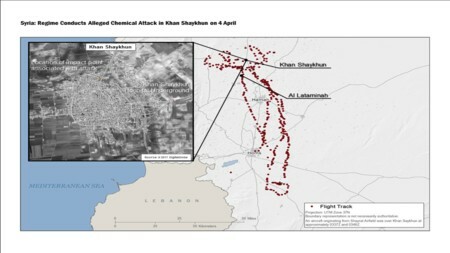 The flight path shows the plane taking off from Shayrat, one of Assad's military airfields, and flying over Khan Sheikhoun the same day the attacks occurred. The Organisation for the Prohibition of Chemical Weaponshad's Fact-Finding Mission established the use of Sarin Gas in a report (PDF) released on 2017, June 29. OPCW and the United Nations have formed a Joint Investigation Mechanism to investigate allegations of chemical attacks in Syria, and in particular the case of the attacks on Khan Sheikhoun. It has been mandated to establish the responsibilities for this event. The report (extracts / PDF), released on 26 october 2017, concluded that a Syrian Arab Air Force aircraft was responsible for dropping the sarin during the attack. The report documents why (one of) the explanation offered by Russia (a bomb strike on a sarin stocking site) is implausible : the nerve agent would then have been burnt and buried and not released in such huge quantities in the air. It also studies the hypothesis of an artisanal ground bomb releasing sarin gas, and dismisses it. It concludes that a Syrian Soukhoï-22 attacked at 6:45 am, dropping first three conventional bombs and then one chemical bomb. Evidence collected includes satellite images, interviews with witnesses and victims, communications from fighters, photos and videos including some images of bombs remnants, and analysis of samples. There has been no evidence presented whatsoever. Russia, U.K and Germany has called for an investigation but U.S has shown no interest so far. Assad has the full backing of the Russian air force. Using chemical weapons can be a justification for U.S to illegally attack Syria. Which incidentally is what happened today. All Syrian chemical weapon stockpiles were allegedly destroyed and U.N inspections were subsequently performed. But only in areas controlled by the Syrian government forces. Not the answer you're looking for? Browse other questions tagged syria or ask your own question. What is Putin's stance on United States invading Syria and overthrowing the Assad regime?